Measures 12.5 x 13 x 2.5"
A solution for all types of photographic and video shooting such as weddings, portraiture, fashion, interiors and still life, the Superpanel Soft Dual Color LED Panel from Lupo has color temperature that's variable from 3200-5600K or anywhere in between to match other fixtures, ambient light conditions, or just for creative effect. Light intensity is variable too from 0-100% without color shift. This version of the Superpanel has a soft, flattering quality of light that's exceptionally even from edge to edge of the fixture. Every effort has been made to combine strength with light weight. The Superpanel has a carbon fiber reinforced techno polymer shell that provides high resistance to rigorous use while keeping its weight down to 6 lb. The 12.5 x 13 x 2.5" panel consumes just 150W and outputs the equivalent of a much higher rated tungsten fixture, while it maintains a high CRI rating of 95 indicating an accurate rendition of color down to the subtlest hue. Under normal working conditions the Superpanel's fan is barely perceptible but it can simply be turned off for silent, passive heat dispersion and dead quiet operation in sound-sensitive environments. Another important benefit is the light's power options. The Superpanel Soft Dual Color is ready for worldwide use, thanks to the inclusion of a multi-voltage AC adapter, but it can also run on an optional, dedicated battery for up to 1.3 hours when mains power is unavailable. The Superpanel's color balance can be adjusted from 3200-5600K or anywhere in between to match other fixtures, ambient light conditions, or just for creative effect. Light intensity is variable too from 0-100% without color shift. Your adjustments are displayed on the fixture's rear LED screen. Lupo LED panels are a wise solution for all types of photographic and video shooting: weddings, portraiture, fashion, interiors and still life. They are also ideal for use in TV studios of small and medium sizes or in spaces with low ceilings, thanks to the panel's compact form factor. The carbon fiber reinforced techno polymer shell guarantees high resistance to any type of intense use while weighing 6 lb. True Color Technology makes possible a Color Rendering Index (CRI) rating of 95 for all models of the Superpanel range. The Superpanel comes with a multi-voltage AC adapter for worldwide use but you can also run the light with a separately purchased battery. Under normal working conditions the Superpanel's fan is barely perceptible but it can simply be turned off for silent, passive heat dispersion and dead quiet operation in sound-sensitive environments. Box Dimensions (LxWxH) 20.0 x 17.9 x 5.6"
Superpanel Soft Dual Color LED Panel is rated 5.0 out of 5 by 1. 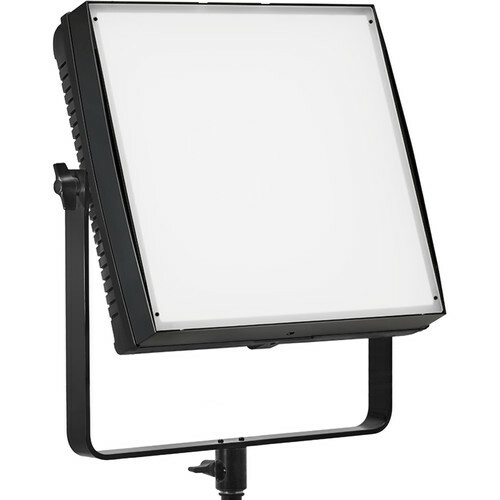 Rated 5 out of 5 by David from Better than Litepanels Prior to getting the Lupo Superpanel, I owned 2 Litepanels Astra. The Astras were fragile and both became unreliable after 6 months of use. I'm in no way tough on my gear. The Litepanels were never dropped and were always transported in a case. It just seemed after a few months, the electronics would become intermittent. Sometimes they's turn on, sometimes not. Local gaffers I know have the same issues with their Litepanels. It seems they collect dust and junk around the dimming knobs. You have to disassemble them to clean to out. The Lupo Superpanel was bought as an alternative. The soft panel works flawlessly. It seems to be made with a thicker / better plastic than the Astras. I ended up buying 2 more Lupos (the regular dual color panels). Light output is amazing! About 1/2 stop brighter than my Astra 6X. This would be a no brainer purchase except that B&H does not stock them at the time. They need to be dropped shipped from the distributor. Delivery is slow, about a month. If you can wait for your order, it's a highly recommend.